The greatest battle of all time! The Battle for the entire Universe! The Ultimate Battle of Dark versus Light, of Matter versus Anti-Matter in the biggest battle of all time for the creation of the entire Universe. In the beginning there was only darkness ... Let there be Light! In the beginning there was only an endless vacuous void filled with darkness, when suddenly a singularity of un-imaginary power appeared and exploded in a massive explosion of energy, particles and gasses, the Big Bang! This quickly inflated time and space and expanded into the Universe and the original greatest Battle of all time began between Matter and Anti-Matter, both trying to annihilate each other to become the dominate force in the Universe. Luckily for us, Matter won and eventually formed into Giant Gas Clouds then the Suns, Moons, Planets, Nebula and Galaxies of our very own Universe of today. 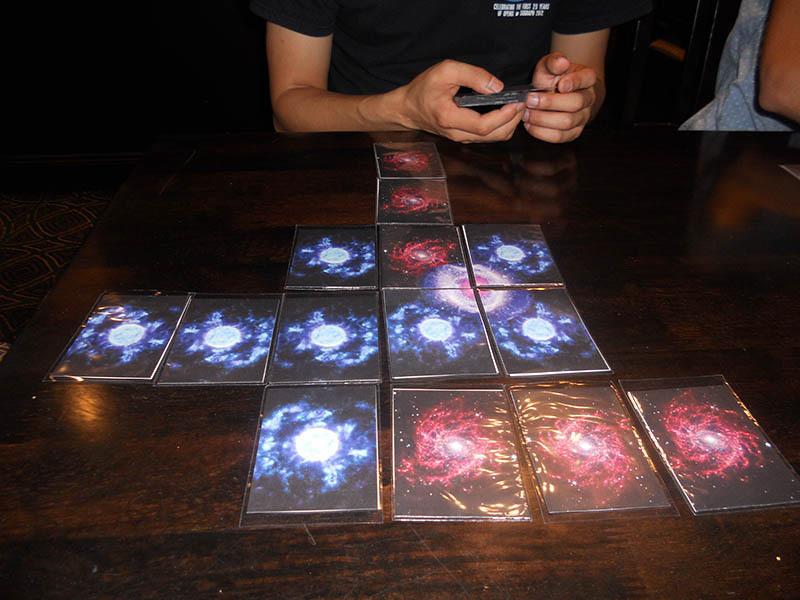 Based on the Ancient game of "Go" but updated to a celestial and portable Game. 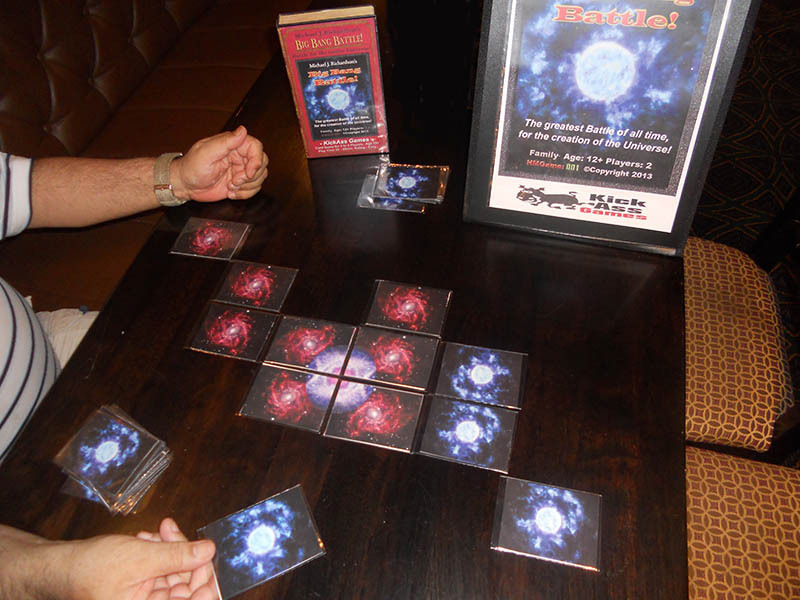 You play one of two sides either Matter or Anti-Matter just after the Big Bang, battling to take over the early Universe and at the end of the game, you try to have the most either Matter or Ant-Matter cards in the Universe to win. Can you win the greatest, ultimate battle of all time? This game is 100% skill and no luck is involved. Simple rules and simple play with strong sophisticated strategies where luck plays no part, just your mind against your opponents. You should join in the Big Bang Battle! game experience and match wits with and master your friends and family. Addictive “just one more game”, style game - Great for all the family - any age and perfect for the family games night or for fans of “Go” or “Reversi”. Try Big Bang Battle!- Now! and unleash your strategic mind. Anti-Matter (Blue) fights back and dominates the play. 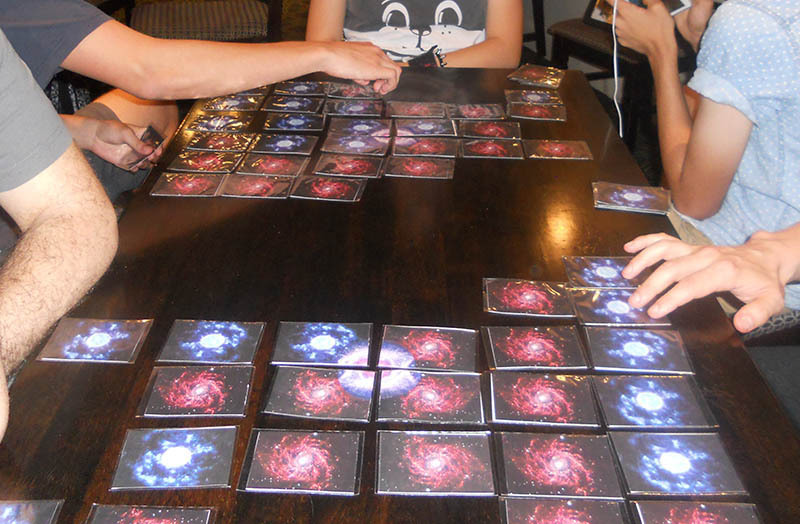 Unpub 4 Con- Australia - Big Bang Battle! - mini tournement with shot of Mickey (in Blue Shirt) the overall winner.